Lilongwe (Malawi), Jan. 8 : India and Malawi should use the Pan African E- Network to re-energize existing bilateral ties, said visiting Indian Vice-President Mohammad Hamid Ansari. Highlighting the historic ties of friendship and cooperation between India and Malawi during a speech delivered at a State Dinner hosted on Thursday in his honor by Malawian President Dr. Bingu Wa Mutharika, Ansari said this relationship built upon shared values and traditions should use the network to bridge the socio-economic and digital divide. "I am happy to learn that India''s Pan African E- Network project has been commissioned in Malawi. This project, which is fully funded by Government of India, aims to connect the 53 African countries for the purpose of tele-education and tele-medicine and video-conferencing among all the Heads of State in Africa," Ansari said.
" This visionary project will endeavor to bridge the digital divide, and contribute to building technical, education and health sector capacities in Malawi. This is a shining symbol of South-South cooperation," he added.
" We share a common commitment to democratic governance, rule of law, respect for human rights and inclusive development. Our bilateral cooperation in agriculture, trade, investment, small and medium industries, culture and education needs to be stepped up significantly and new areas of cooperation explored," Ansari said. Reiterating New Delhi''s committment to provide all possible assistance to Malawi, Ansari said he was happy to note that Malawi had utilized the Line of Credit of 30 million dollars extended to it in 2008 for irrigation, grain storage and tobacco threshing projects. "We believe that our contribution building of Malawi''s own capacities, infrastructure and food security is a valuable component of our partnership. As part of the commitments made by India during the India-Africa Forum Summit, we would also like to extend a Line of Credit of USD 50 million to support the development goals of Malawi," the vice-president said. He also said that the Indian Government has announced a grant of USD one million as emergency relief for the rehabilitation of Malawi earthquake victims. In addition, he said New Delhi has announced a USD four million in grants to support Malawi''s development in agriculture, health and education sectors. Ansari also expressed satisfaction private sectors of both countries exploring possibilities of forming partnerships to realize the potential for cooperation. "The opportunities under the unilateral tariff concessions to the Indian market should be utilized to enhance access of Malawi''s produce to the growing Indian market. Our cooperation with Malawi under the Indian Technical and Economic Cooperation (ITEC) programme in the field of human resource development is a matter of satisfaction. India has been providing training positions to Malawians under the ITEC programme and these have increased substantially over the years," he said. He said the Indo- Malawian partnership is an integral element of the two countries "larger vision of close and multi-dimensional engagement with African countries." He said that att the first ever India-Africa Forum Summit held in New Delhi in April 2008, African leaders and Indian Prime Minister Dr. Manmohan Singh had jointly adopted a Framework for Cooperation to strengthen bilateral engagement. "We are confident that along with our partners in Africa, we would announce this year a joint plan of action at the continental level and a follow up mechanism to implement our Framework for Cooperation," Ansari said. He said the 7000- strong vibrant Indian community in Malawi serves as a vital link which has strengthened the bonds of friendship between the two countries. " 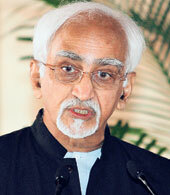 We see an important role for the Overseas Indian community in building our relationship further," Ansari added. The vice-president said that India and Malawi share common perceptions on major international and multilateral issues of mutual interest. "We are determined to work with your great country on the issues of UN reforms, the ongoing multilateral trade negotiations, fight against terrorism and the issue of climate change. We would work together to ensure that the vital interests of developing countries are protected and no barriers are placed that could constrain their developmental aspirations," he said. India and Malawi should credit themselves for strengthening their respective democratic institutions, and therefore, it was necessary for functioning democracies and countries with similar worldviews to interact frequently.